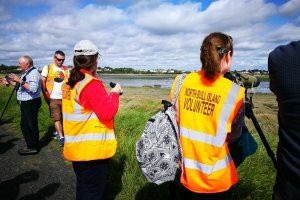 Dublin City Council is seeking applications from members of the public to join the Bull Island Volunteer Programme. Bull Island is managed by Dublin City Council, has several nature conservation designations for the habitats and species it supports, is designated as a special amenity area for its aesthetic and recreational value, and is an integral part of the Dublin Bay UNESCO Biosphere. It is used daily by walkers, bathers, kite-surfers, beachgoers, bird-watchers, nature enthusiasts, and many others. The Bull Island Volunteer Programme was established in 2017 and consists of a team of dedicated volunteers who are interested in promoting the ecological, cultural, and educational values of Bull Island to fellow visitors. Volunteers are involved in a range of activities, including visitor and stakeholder engagement, designing and delivering educational family activities, conservation management, and wildlife monitoring. Contribute to the vision for Bull Island and the wider Dublin Bay Biosphere, i.e. to promote a balance between the amenity, recreational and economic potential of Bull Island and its ecological, cultural, and educational values. While no formal qualifications are required, candidates must have a love of nature and outdoor recreation, and demonstrate competence in interpersonal skills, organisation and teamwork. Any previous experience or knowledge in the following areas would be an advantage: facilitating/ leading groups; working with young people; history/ ecology of Bull Island; field experience of ornithology/ botany/ marine ecology; volunteering or citizen science; teaching or customer care. Candidates should ideally live close to Bull Island or be regular visitors to the Island, however, any candidates (including students) who can commit to a minimum of two days a month (weekends) for a twelve-month period will be considered. Candidates should demonstrate an enthusiasm to helping Dublin City Council in the stewardship of Bull Island. Candidates must be over 18 years, however there is no maximum age limit. Applicants are invited to submit a Curriculum Vitae and covering letter to biodiversity@dublincity.ie or Bull Island Volunteer Programme, Parks & Landscape Services, Dublin City Council, Block 4, Floor 0, Wood Quay Civic Offices, Dublin 8 on or before Monday, April 30th 2018. Applicants will be Garda Vetted. For further information, please contact biodiversity@dublincity.ie or 01 2223418.